As I sleep, my mind will erase everything I did today. I will wake up tomorrow as I did this morning. Thinking I'm still a child. Thinking I have a whole lifetime of choice ahead of me ...' Memories define us. So what if you lost yours every time you went to sleep? Your name, your identity, your past, even the people you love - all forgotten overnight. And the one person you trust may only be telling you half the story. Welcome to Christine's life. First thing that comes to mind is OMG! What an amazing amazing read. I can honestly say that this book had me at the edge of my seat. To say it's a definite page turner is an understatement. I stayed up till past 1 am to finish reading. Once I picked this book up I wasn't able to put it down. I read it everywhere, while cooking, walking to the bus, etc. It was that good. The ending was a great ending. I didn't exactly expect it. It was just an amazing book. And I'm super excited to say this book was picked up for a movie which starts/started film/filming this year. So I can't wait for it to come out on theater. Hopefully they won't change it much. Can you imagine yourself waking up every morning and not knowing who you are? Where you are and who is this person sleeping beside you? Well that's Christine's life. She suffers from amnesia due to an "accident" and she wakes up everyday not knowing anything from her life. Every morning her husband has to answer questions as to who she is, who he is, where she is and what happened. She doesn't remember much, just fragments of memories. The one thing that does help is the journal she keeps in a shoebox in her closet. And a Doctor she has been secretly working with to find out how to help her regain her memory. Almost every morning she wakes up and she gets a phone call telling her that she has a journal in her closet to help her remember or cope with what she has forgotten and feeling. As she reads this journal of the previous days she discovers she has been lied to. She sees that she's been working with Dr. Nash and doing different tests to try and help her with her amnesia. What she doesn't know is that Dr. Nash knows a bit more about her past and uses that information to bring out some memories. As he continues to push further into the study, she begins to have more and more different new memories in which he encourages her to write in her journal. He explains how revisiting certain places and people in her past might help regain more memory. But the deeper they go into the study the more information comes out and the more dangerous it becomes. This is a nail biting, heart racing experience. S.J. 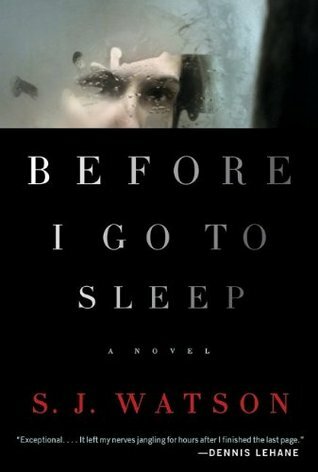 Watson did an amazing job with this book and I am so glad that I was able to read it, courtesy of Netgalley. I can't wait for the movie to come out. If you're looking for a thriller and suspense, then this is YOUR book! 5 stars and 2 thumbs up! A definite definite MUST BUY! And a definite "Good Choice for Reading"! sounds good! can't wait to read it! It was a really good read. Whats strange now is that, now that I read this book. Im coming across more books with the same concept. Is people with amnesia a new trend now? To me this one is the original and I love this book. So I hope you enjoy it as much as I did.